Contain an unlimited number of pets with our smallest wireless receiver collar that features a rechargeable battery and 5 adjustable levels of static correction. This extra receiver collar can be used to add another dog or as a replacement collar to the Stay + Play Wireless Fence (PIF00-12917) and is also compatible with the original Wireless Pet Containment System (PIF-300). This newer version of the collar now includes the charger. The Stubborn Dog model features 5 levels of static correction at a HIGHER INTENSITY for stubborn or hard-to-train pets, plus a tone-only mode for training. Compatible with PetSafe® Wireless Pet Containment System (PIF-300 system, IF-100 transmitter) and Stay+Play Wireless Fence (PIF00-12917). Note: The Pet Area cannot be changed into a square or rectangular shape. A variety of factors including terrain, topography and metal objects may affect operating range. Once your pet has learned the system at home, you can then introduce travel. Your pet should be aware of the warning tone and not go past the boundary, no matter where you are. Take the Stay+Play anywhere there is an outlet and more than 45-feet of land to cover. Contain your pet at the park. Take the Stay + Play Wireless Fence on vacation. Use the System in your RV. Keep the same training with every move. 1. What is the expected life of the rechargeable receiver collar for the PetSafe Stay+Play Wireless Fence? The rechargeable receiver collar for the PetSafe Stay+Play Wireless Fence has an expected lifetime of 3 to 5 years. The battery can be fully charged within 3 hours and can last up to 3 weeks with one charge. 2. If the area in which I wish to contain my pet is larger than ¾ of an acre, is there a way to expand the boundary? The radio signal which creates the boundary is controlled by a Transmitter. The PetSafe Stay+Play Wireless Fence boundary can be expanded by using multiple transmitters and overlapping the radii at least 10 feet. Keep in mind that each Transmitter covers up to 105 feet from the center of the Transmitter in a circular pattern (210 feet diameter). Each Transmitter requires an electrical outlet and must be placed indoors. The maximum distance between Transmitters is 150 feet from one another. 3. 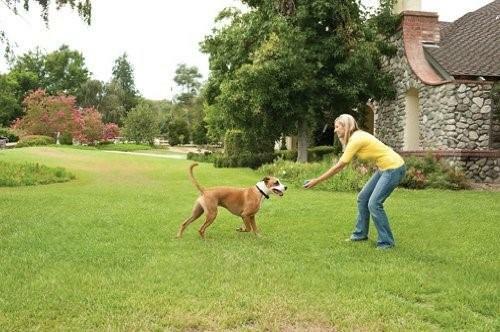 Will the PetSafe Stay+Play Wireless Fence system work on a sloped or hilly yard? Hills and slopes could affect the signal if there is a significant change in the grade of the property. The collar has to be able to receive the signal at all times. The Transmitter may need to be tested in multiple locations to find the ideal boundary. Unfortunately, this will not be the best option for all properties. Some locations would have better results with wired containment.